The universe is filled with stories. We simply learn new ways of telling them as me go. And what this book – Out on the Wire– does in that respect is genius. Jessica Abel knew was recruited by USA radio host Ira Glass to document the making of his show, This American Life. Since then, she has gone on to research both the fields of audio and graphic illustration, culminating in this book, Out On The Wire. Printed in comic book form, (we’ll come back to that), it is essentially an investigation into the narrative techniques and ideas used by modern journalists and storytellers, and it’s massively relevant to both radio producers and podcasters. Long story short, I absolutely love it. Radio is often referred to as an invisible medium. That’s certainly true since you can only “see” the pictures in your mind, but in a way that’s also true of the stories it tells – you don’t always realise why documentaries and the like are done the way they are or why certain questions are asked of the interviewees. This book explores these factors, and it is utterly fascinating and easy to follow. As you read the book, you’ll feel like you’re being hit by revelations so simple as to be obvious, to the point where you suspect you knew them all along. And maybe you did, but they’re still revelations. Okay, maybe an example here; like, opening up to your interviewee a little in order to get them to relax along with you and open up themselves. Sure, seems obvious, but does everybody really know that? Abel does. It’s a hugely informative read and accessible to veterans and newcomers alike, and I feel like it’s arrived at just the right time. Audio production – radio, podcasting, drama, documentaries – has never been hotter, and is only going to grow. As I touched on at the beginning, it’s all about telling stories, whether they’re factual, fictional, dramatised or presented as real life. And what better way to show the “infinite diversity in infinite combinations” principle than by combining this book’s narrative with the medium of comics? Jessica stars as herself in the comic, along with big-name contributors like the aforementioned Ira Glass, and they talk us through their journey of storytelling discovery. It’s a joy to behold, and partly what makes it so easy to follow. Okay, it almost feels like cheating to us audiophiles, especially when we’re learning how to tell stories WITHOUT pictures! Just put that from your mind – it’s a book, after all. After all, stories are stories, and there are many ways to tell them. I’ve made a few documentaries and dramas in my time, so I don’t feel like a complete beginner – and certainly no expert – so it was wonderful to see these techniques highlighted in such a concise way. It tells you things you feel like you already knew deep down, and maybe you’d just forgotten. Instinctive knowledge made clear. 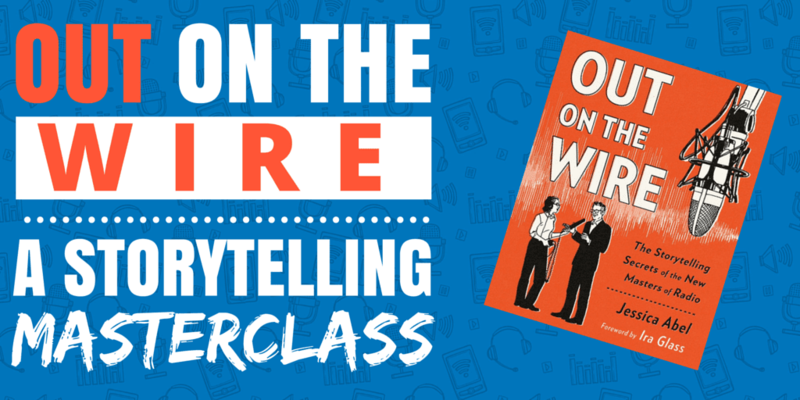 I can honestly recommend this to anyone with an interest in stories – not only those who portray them, like podcasters and documentary makers, but also to those teaching the craft, be it at High School, College, University or Short Course level. Out on the Wire is available now. Have you read this book? What did you like or dislike about it? And are there other texts that deserve a place on my shelf? Let me know in the comments box below.